here I sat at the head of the dinner table with my family eating our Thanksgiving meal. I just said grace and gave thanks to all the blessings our family had for this year. As the family piled every inch of their plate with roast chicken, potato salad, cesar salad, and pasta, I thought about last year’s Thanksgiving. It was totally different. This time last year, I learned that my cancer was back and was in my liver. It was a bitter Thanksgiving to celebrate. I had a hard time looking for something to be thankful for. I was wallowing in sorrow and hardly ate. Many things have happened since then; chemo, surgery, more chemo, and marathon. I am back at the head of the dinner table surrounded by my family, again. Many have called my comeback story inspiring. To me it was a humbling experience. I have gone on with my life, started working again, and continued running. Now, I have an intense appreciation of life. I savor each breath I take. I cherish each encounter I have with you and everybody. I am learning to meditate too. Yes, meditate. I think that is the next step in yoga. It is nothing fancy, but it is a way for me to honor my body. My body has taken a lot of beating not only from chemo and surgery, but also from my running. It heals itself and allowed me to enjoy my Thanksgiving dinner. I can do many things with my body. With meditation, I can speak to my body, pay respect, and give homage to it. If it is true that God resides in each of us then I am in the right place. Honor your body by keeping it healthy and you will have peace. 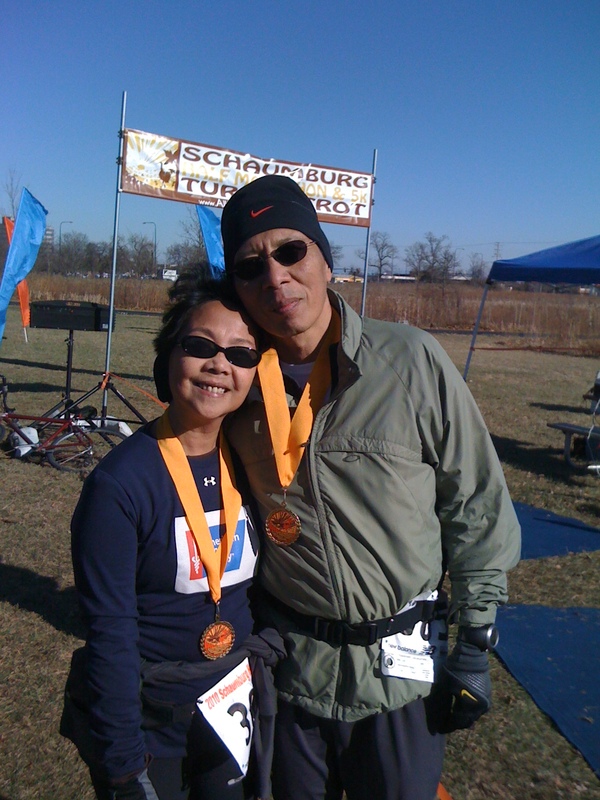 On the running front, my wife and I just completed a half-marathon yesterday (2hrs:46min:27sec). It was a personal record for her. The race start was cold 22F (-5C) and my gloved hands were numbed. It finally warmed up three miles into the race. There were about 700 runners; the smallest race I have entered thus far. The race brought out the familiar memories of pain and relief. You got to try running or find the limits of your endurance. It is like finding the limits of life. There is none. It is yours for the taking. Meditate to honor your body, it will open you up to more blessings. PS: I received, anonymously, a care package of Life is Good scarf and hat. Thank you very much for this generous gift. It keeps my balding head warm. On Tuesday, November 30, I will have my chemo maintenance again. Ommm…..
said this to my friend during our lunch last week. She worries about her kids which is understandable. At my age, mom still fuzzes over me when she is here. What can I say, parents worry about their kids even if these kids are adult already. I worry myself, but somehow I have learned to say to myself. It is scary not to be in control. The only thing we control are the choices we make. Scolding you kid versus trust more, eating meat versus vegetables, driving versus walking, cows milk or soy milk, etc. It is the repercussions that are scary not the choices. But what’s the point? Nothing. I have been scared shitless of cancer taking my life away one day but I cannot allow it to rule my life. I have come to understand that cancer will do its job I will have to do mine. Or that life will take care of its own. I had a reminder of cancer doing its job lately or perhaps chemo toxins waging war with cancer. My body is still a raging war zone. The fatality this time is my hair. My hair is falling in bunches. They are just falling like mad. It just started happening this week and it baffles me. My last chemo maintenance was more about two weeks ago and it is only now that I am shedding like my beagle, Maggie. I do a mental checklist. I am up two pounds. Eyes are clear. Have been logging about 18 miles of running a week. Stool is clear. Some darkening of my hands again. But it bugs me why my hair is falling, a lot. So I cut my hair really short, Army short. I figure, if I go bald people might as well get use to seeing my hair short now. “It will grow back, babes.” My wife assures me. Thank God for a loving wife. Tomorrow is long-run day. 10 miles. Forecast is in the upper 40F. We signed up for a half-marathon Thanksgiving weekend (November 27), so it will be our last long run before tapering. Note to self: don’t forget to cover your balding head, Bo. It will be cold early morning. Life is good.